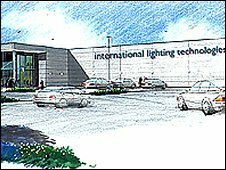 A £28m factory, which has been hailed as the biggest investment in the manufacture of lighting equipment for 70 years, has opened in County Durham. About 700 jobs have been secured at Thorn Lighting in Spennymoor with the opening of the new plant, which will make low-energy fluorescent fittings. The company started work on the purpose-built plant last year after the existing facility became too small. The revamped factory includes an academy for training employees. Bishop Auckland MP Helen Goodman, whose constituency includes Spennymoor, said the new factory was "fantastic news". She added: "This kind of investment shows that, even in the current economic climate, progressive and innovative companies like Thorn still have real confidence in the future of the local economy." Gary Hodgson, operations director of Thorn UK, said: "Our aim was to replace a sprawling complex with a modern, lean and flexible successor."